As president of SPARC I welcome all of you today: members and friends of SPARC and coalition organizations, members of the media, and others who care about Orange County and its future. We are thrilled, after 18 years of hard work, strategizing, lobbying, fundraising, networking, among other things, to have arrived at this place, at this time, when we can announce to all, with intense pleasure, that we have basically achieved our goal. If only Ben Kissam were with us. We, SPARC, the Sierra Club, and the O.C. Federation of Sportsmen, have been pursuing legal action since our case was filed in October of 2000, continuing in the courts to the present time. But meanwhile, throughout this past summer, we have been laboriously crafting an agreement with the state agencies, the DOT and the Thruway, an agreement that would win for both sides their most important objectives. Nothing is perfect, but we've done it, and, I must say, it feels good. 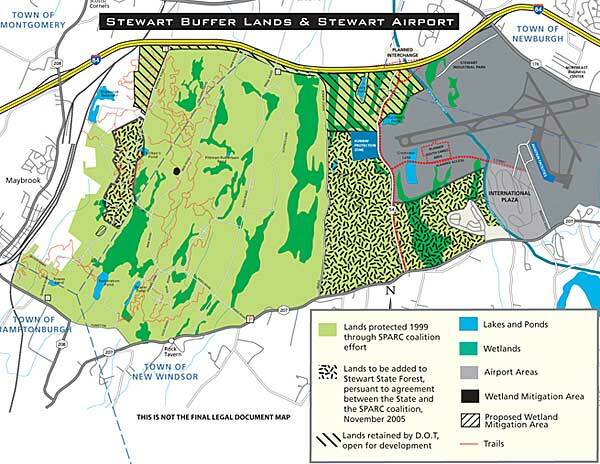 Yes, the highway project is slated to proceed, but balancing its impacts will be the impact of 1,700 additional acres that the state has agreed to add to and make part of the Stewart State Forest. This makes for a total of about 7,000 acres of preserved land, a contiguous open space second in size only to Sterling Forest, and located in the middle of our most rapidly developing eastern Orange County area. These lands are conveniently located and easily accessible to all our residents. They represent lowlands, as contrasted with ridges and mountains, lowlands that are lost to development every day, all year round. Parts of the lands are actively farmed. Every year, more people use and enjoy the land for bicycling, walking, birding, horseback riding, cross country skiing. The land is the largest public hunting area in a multi-county region. It is rich and teeming with wildlife, including rare and endangered species. It forms a noise and safety buffer for Stewart Airport and helps to clean up the environment. It is simply Orange County's jewel. Here are some of the highlights of the agreement. • As the map shows, these are the lands that will be added to the current State Forest lands which comprise almost 5,300 acres. • Approximately three quarters of the acreage west of Drury Lane and between Drury Lane and Maple Avenue, which includes Buchanan Hill, the highest point of the Buffer Lands. • All those lands that fall on the east side of Drury Lane, south of Crestview Lake and below the boundary of the lands that had been leased to NEG as part of the airport, and extending easterly to First Columbia's International Plaza, exluding the West Point housing area and the Little Britain School. • The larger and more southerly portion of the lands along Barron Rd. that had been reserved as a potential industrial development site. • The inclusion of internal roads that were formerly reserved as ROW's for DOT development, specifically Maple Ave. and Barron Rd., to be treated as part of the preserved State Forest lands. • All of these parcels represent approximately 1,700 additional acres to the Forest. • Public access to Tenney's Pond, located within the development area, to include a 25 foot easement around the pond and the use of the pond itself for fishing. • The providing of access points along Drury Lane and Rt. 207 to the lands east and west of Drury Lane. • The requirement of a 500' setback for any buildings in the developed area, so as not to impede hunting on the adjacent State Forest Lands. • A firm deadline of December 2006 for the completion of the Unit Management Plan (UMP). This has been in process since 1999. • The provision that any advisory board related to oversight of the lands or the UMP, include a seat for each co-plaintiff: SPARC, Sierra, and OCFSC. In return, we will discontinue both of our lawsuits and permit the mitigation site, subject to appropriate safeguards for the purple milkweed, to be constructed. We remember that these lands were seized by Governor Nelson Rockefeller in 1971 under the laws of Eminent Domain. We hope that keeping these lands as a public natural resource will, in part, vindicate those displaced residents. We honor their forced sacrifice. We want to recognize and thank the numerous organizations that have at various times endorsed and supported us, including the Sierra Club, the Orange County Federation and its member clubs, Riverkeeper, The Beacon Sloop Club, the O.C. Audubon Society, the Sullivan County Federation of Sportsmen, Sloop Clearwater, Orange Environment, Scenic Hudson, Friends of the Shawangunks, AFFIRM of New Paltz, the NY/NJ Trail Conference, the Adirondack Hiking Club, the O.C. Land Trust, the Windy Hollow Hunt, to name some of them. Certain individuals have also been outstanding in their support of our efforts: our attorney John Caffry, Congressman Maurice Hinchey, Assemblyman Richard Brodsky, the late Assemblyman Jake Gunther, Legislator Tom Pahucki, former Maybrook Mayor Bill Schimpf, the late Frank Hartmann of the Conservation Council, scholarship donor Dr. Eric Singman, Michael Sussman, John Stouffer, Bob Santagata, Pat O'Dwyer, Ann Botshon, Betty Quick, Barbara Clark, Nick Zungoli, John Gebhards, and David Gordon of Riverkeeper, John Yrizarry, David Straus, Spider Barbour, Steve Gross, come to mind. There are many others. We deeply appreciate our Board members: Bo Eriksson, Lynn Barber, Susan Mischo, Tom Forsyth, Mike Serinsky, Ralph Grimaldi, Joan Ruffino, Linda Meyer, and former Board members Diana Krautter, Pat Williams, Lynne Delesky, Frank Carbone, Vicky Matovic, Mauro Parisi, Caperton Tissot, and of course Rudy Vallet. We thank the numerous volunteers that help with so many tasks, all because they love the land and want it saved. But don't assume that this is a farewell speech. Not at all. SPARC, with its partners, will continue to monitor the lands and the provisions of the agreement. The actual land transfer is due to be accomplished by June of 2006. A great deal of input must go into the Unit Management Plan Process. An enormous fundraising effort faces us. We must quickly pay down legal debts of almost $60, 000. This is a serious obligation and it must be tackled immediately. But, in the meanwhile, we are thrilled by what we have accomplished. We hope you are also. Our efforts have not been in vain. We are providing benefits to our communities now and to future generations. We have this wonderful, peaceful, place that is now saved and protected for our pleasure and for our wildlife.